Another dry, sunny but colder day was the Met Office forecast for today, although it didn’t turn out to be quite as cold as they had indicated and not too long after starting out the jackets came off and stayed off for the rest of the walk. 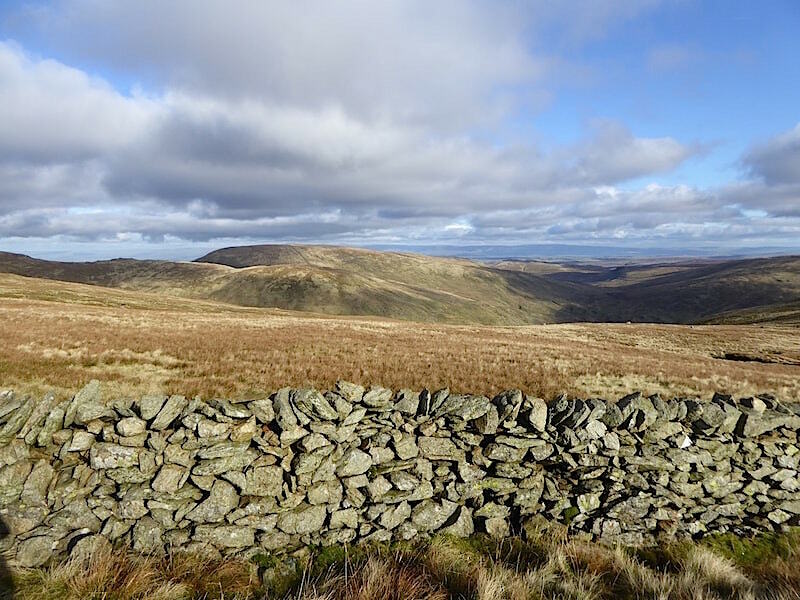 We opted to stay in the far eastern fells, which is more or less home territory for us, so that we wouldn’t be using up valuable daylight by having to drive any great distance. 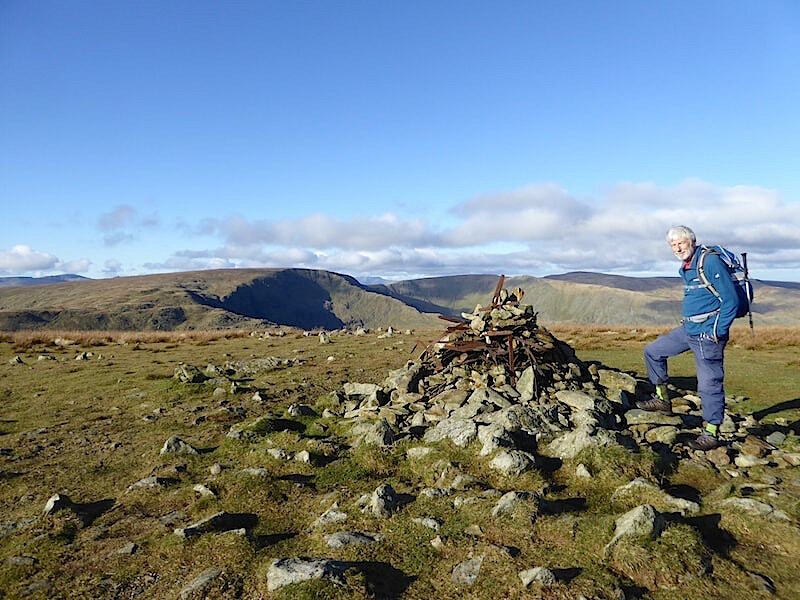 The time thus saved would give us the opportunity to take a longer distance walk over three of the fells which make up the Kentmere Horseshoe, namely Shipman Knotts, Kentmere Pike and Harter Fell, including a couple of detours to Goat Scar and Adam Seat. 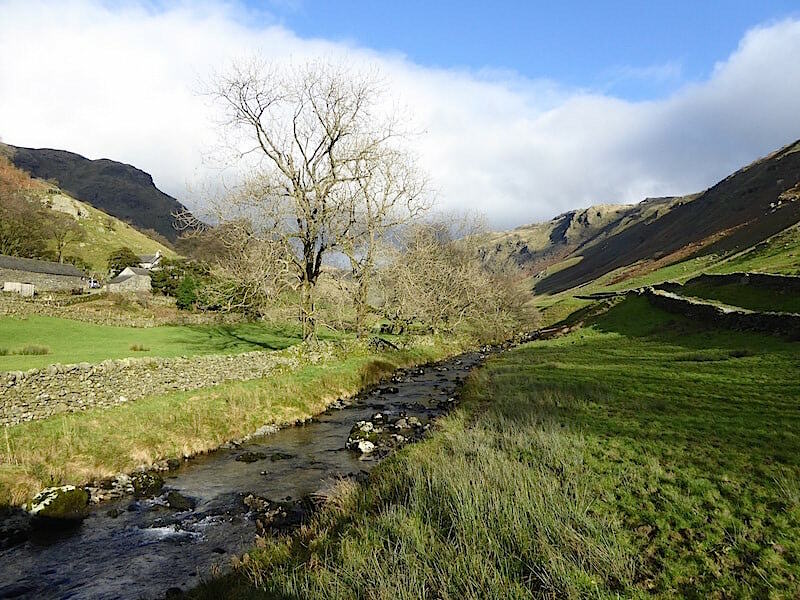 Longsleddale and the River Sprint as we cross the bridge and make our way towards the start of the Sadgill to Stile End path. Its a very bright sunny morning so the shadows are strong and deep in consequence. 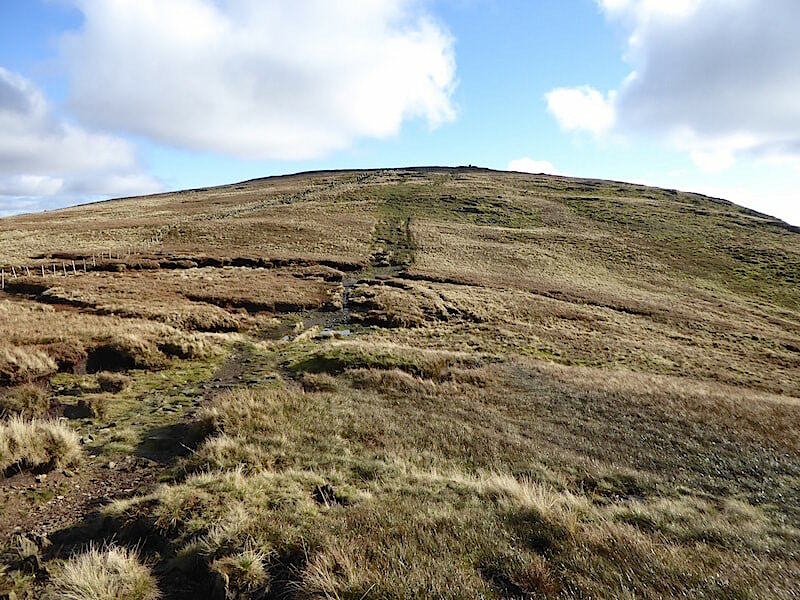 Initially the path is fairly steep so height is gained quite quickly. Across a gate in the wall I took a look back at the bridge and the little car parking area. Quite a few more cars had squeezed in there by the time we had completed our walk. 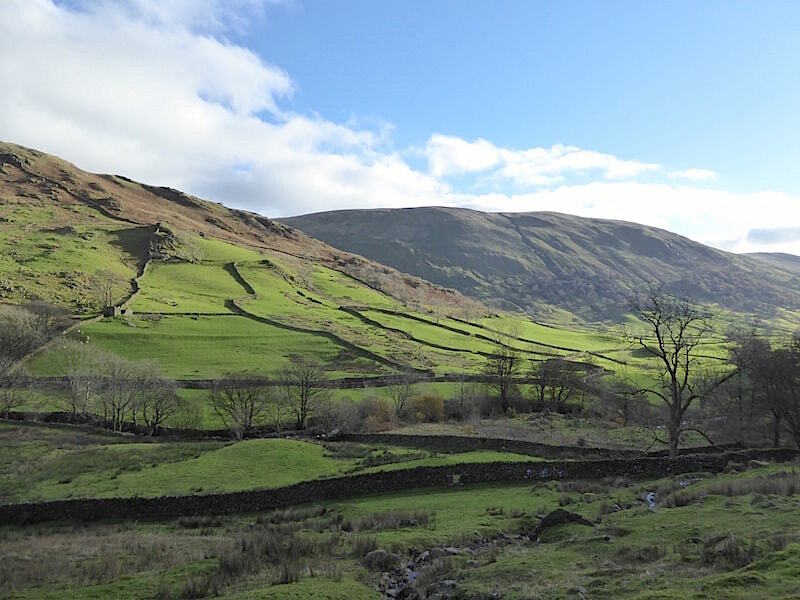 From the same spot I took a look along Longsleddale with the dark mass of Bannisdale Fell rising above it. I was having to wait a while now as the gps was playing up and had to be reset. Apparently at this point it was telling us that we had walked twelve miles from the car park! The gps having been reset and now behaving itself we continued on up the path with a look back to Great Howe across Longsleddale. By the time we reached the second gate the sunshine had given way to some very large and heavy clouds so things became somewhat gloomy for a good while after. Beyond the gate the path has some short hairpin sections, a couple of which certainly got the calf muscles grumbling. 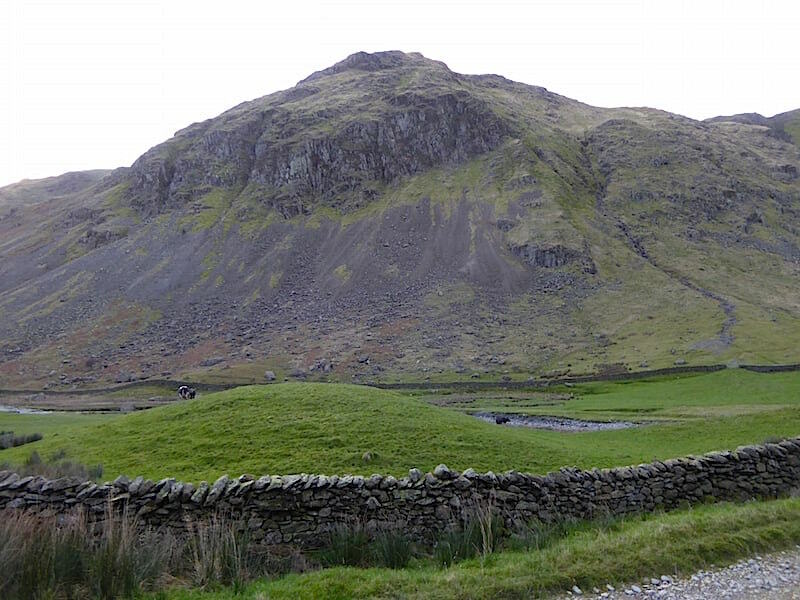 Beyond the hairpins the path flattens out long enough to allow the calf muscles to recover before they have to tackle the climb up Wray Crag. 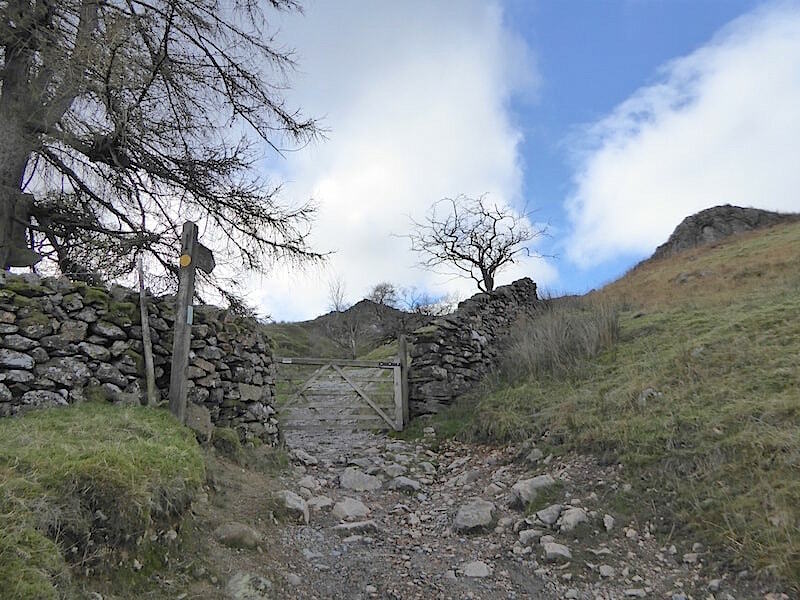 Just around the bend we pass through a gate in the wall and follow the path which can be seen traversing the lower slopes and heading towards the wall going up the middle of the crag. After a squelchy crossing of the lower slopes from the gate in the wall we stop for a breather and take a look back. 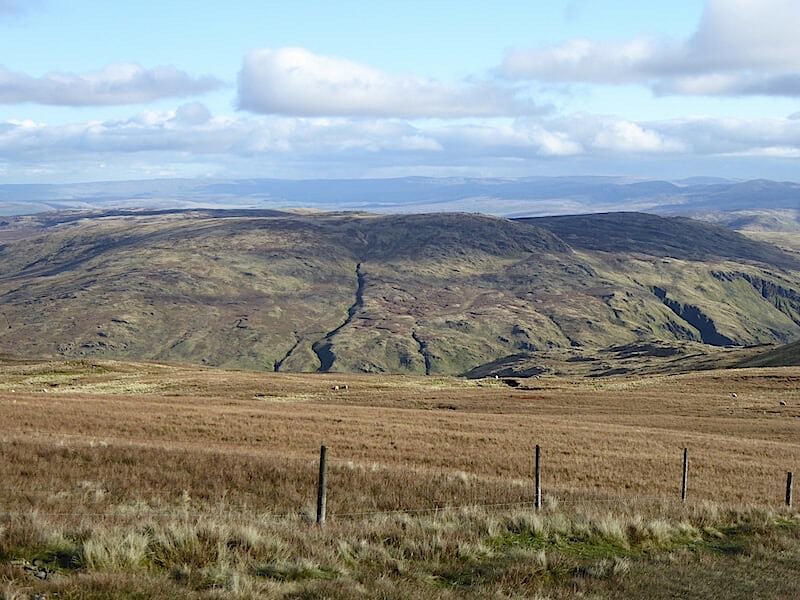 The gate can be seen towards the centre right at the apex of the two green fields down there. 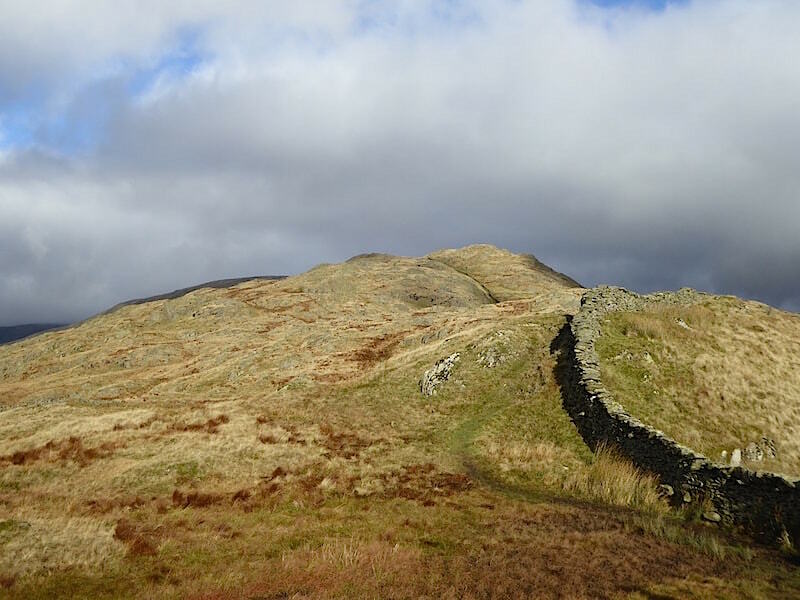 Eventually the path begins to track alongside the wall and from here on the climb becomes much steeper. The camera went away at this point as we were about to climb a very rocky section where hands would definitely be needed. In a few places we were confronted by some vertical, wet and very smooth sided slabs to clamber over and even gaining a toe-hold on them proved to be something of a challenge, especially for my little legs. Lacking the sure-footedness of mountain goats or the feline grace of the snow leopard I don’t suppose our ascent would have scored many points in the agility or style department. 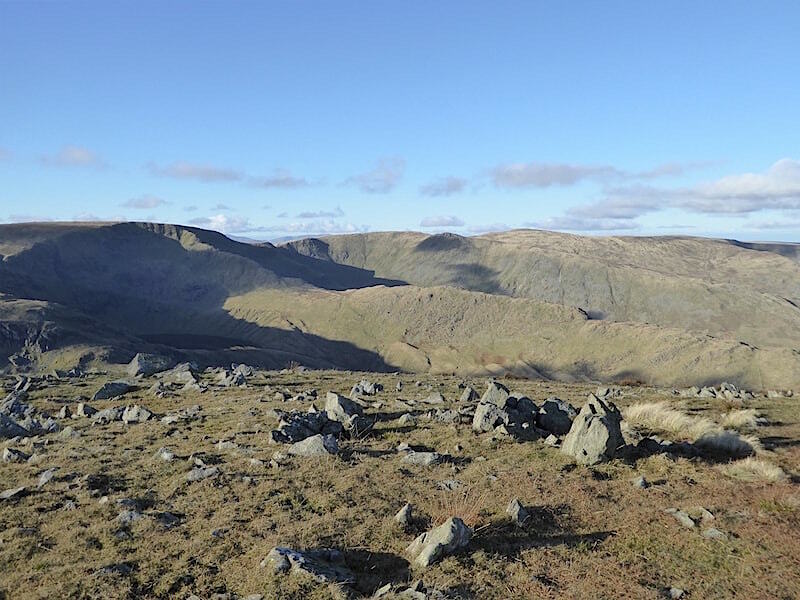 We reach the flatter area above the crags and take a short break for a drink. We were hoping for a better view of the fells over there but the extensive cloud put paid to that, although it does add quite a bit of drama. 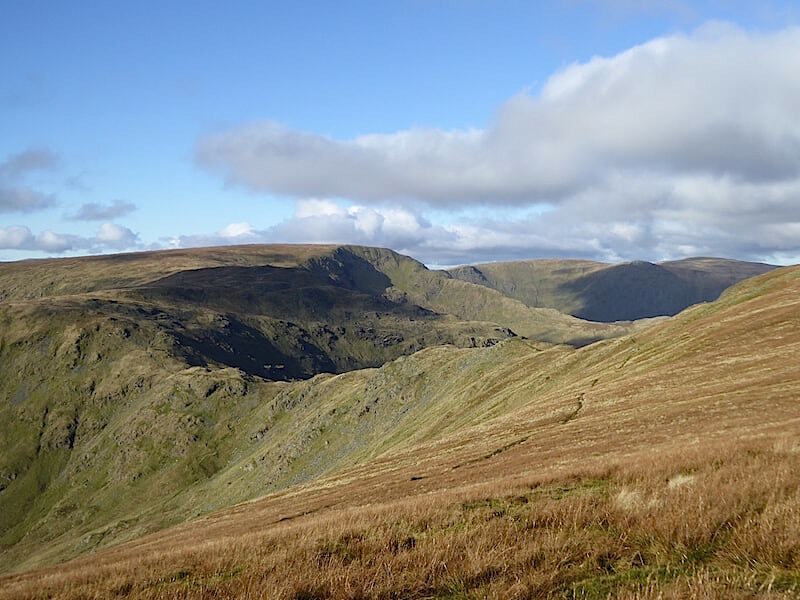 From left to right they are Yoke, Ill Bell and Froswick and they form the western arm of the Kentmere Horseshoe. 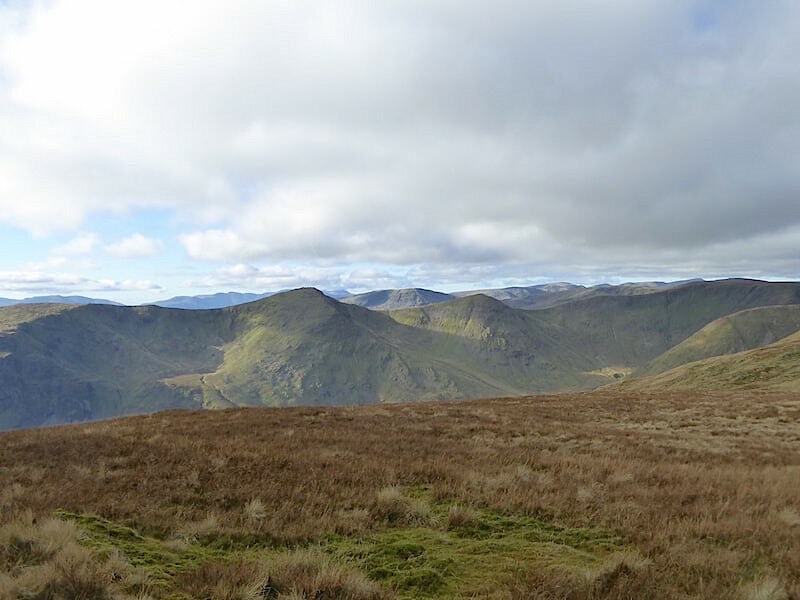 The route we are taking today makes up the eastern arm of it and at its head, and covered in cloud over to the right, are Thornthwaite Crag and Mardale Ill Bell. Time to move on and there’s some marshy ground in the hollow to negotiate to begin with before we reach the higher and slightly drier ground beyond it. Shipman Knotts summit is still some way off though. 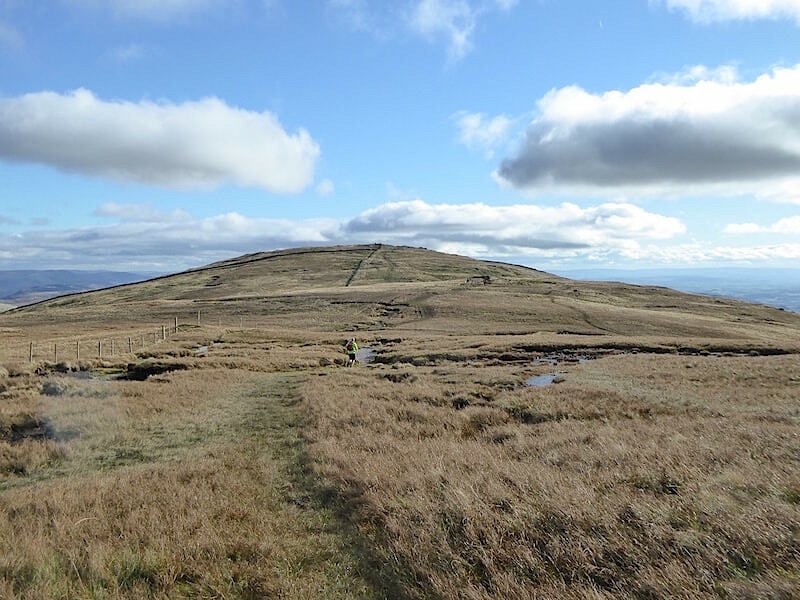 We reach the top of the first knott below which another marshy area has to be dealt with, and where paths to the left and right of it avoid the worst of the wetness. 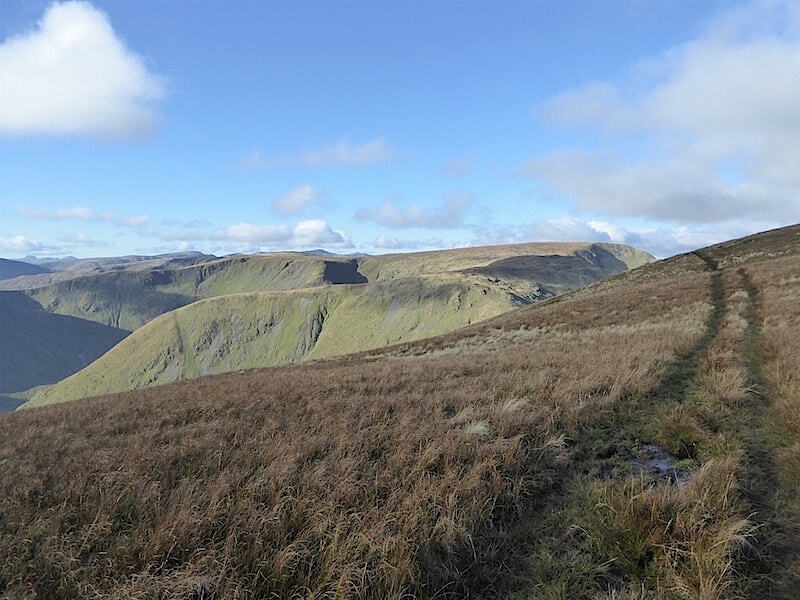 For no particular reason we took the one going off to the right, and at the far end of it continued on up the path alongside the wall and on to Shipman Knotts summit. 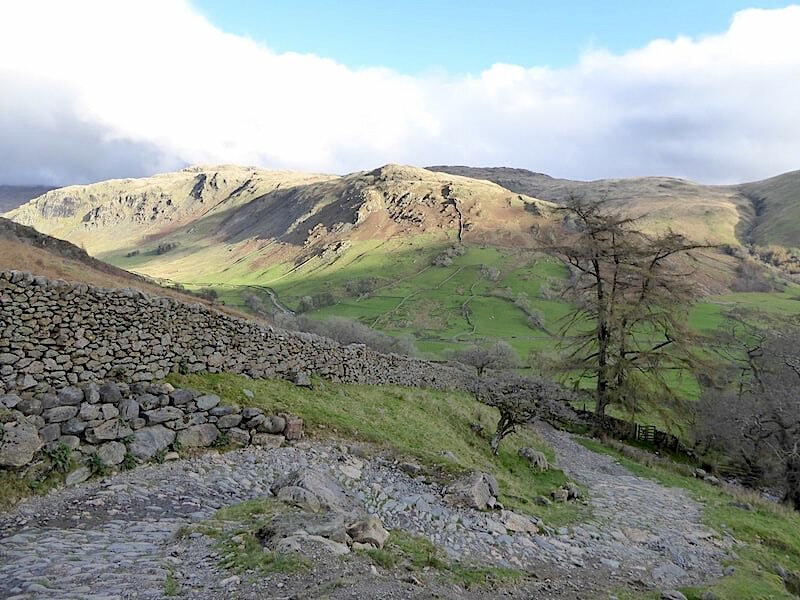 After a stiffish climb through the narrow gully beside the wall we reach the summit of Shipman Knotts with a spell of sunshine to mark our arrival. 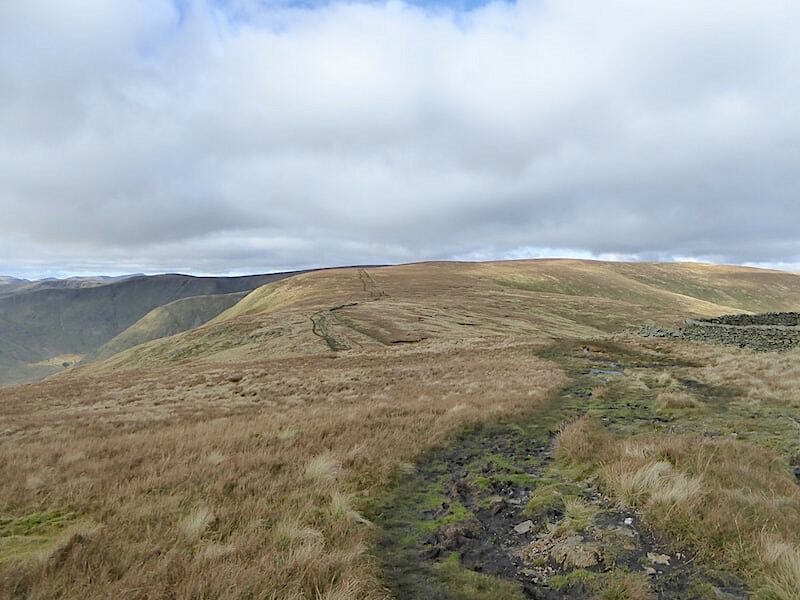 Usually the next destination for walkers would be Kentmere Pike up ahead towards the left. 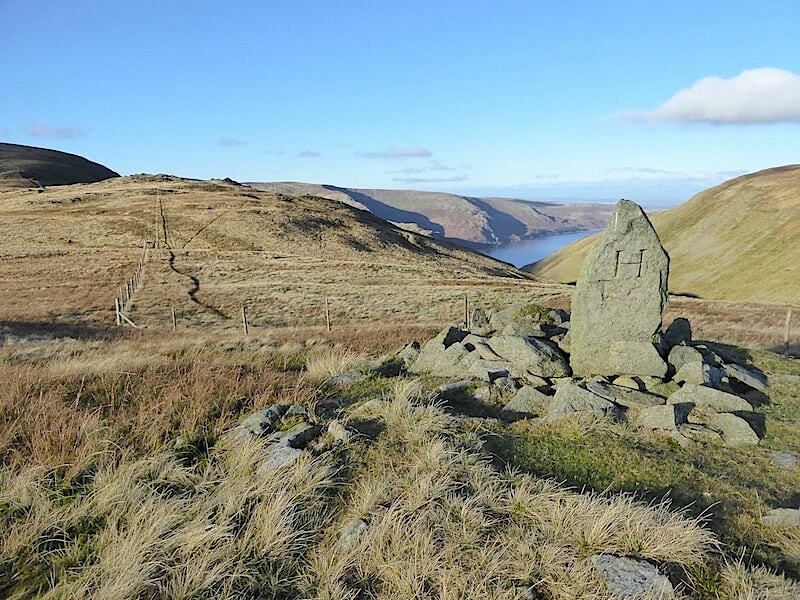 Before that though we are going to have a stroll over to Goat Scar, the low rise just behind the cairn, to enjoy the views from there. 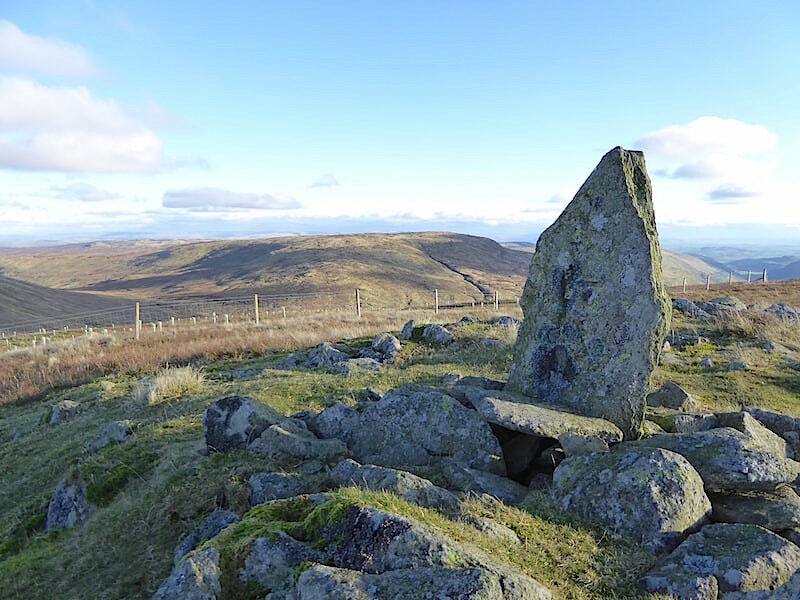 A look over to the west from the summit cairn before we leave. The view being slightly better now that Yoke has some sunlight on it. 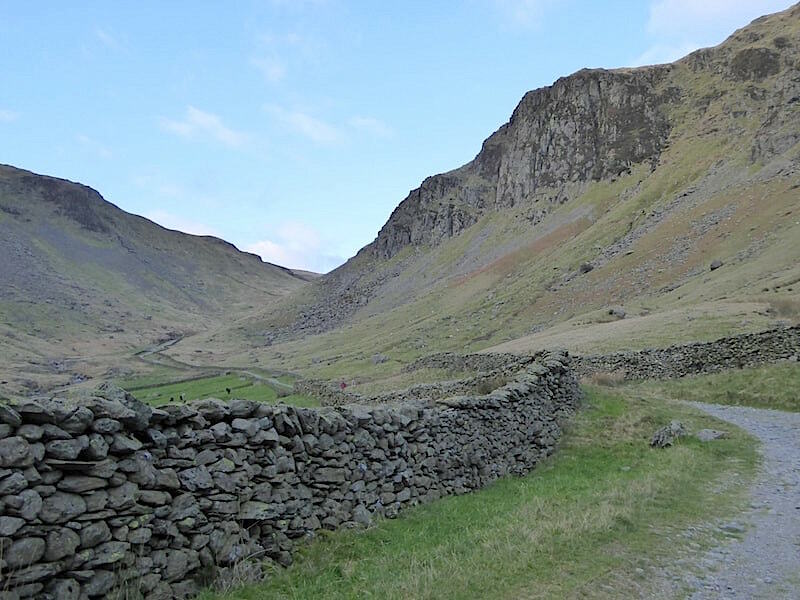 Heading over to Goat Scar the tip of which can just be seen to the left of the wall. 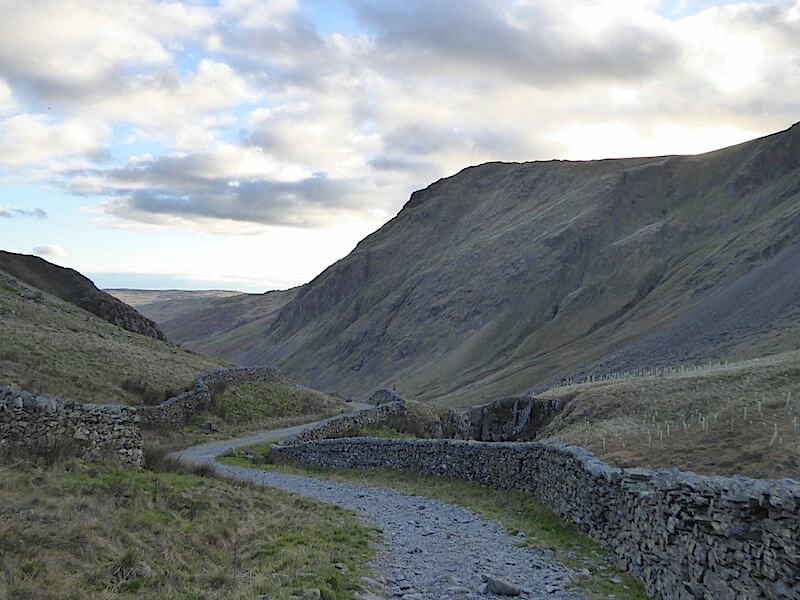 We do not follow the wall however, access to Goat Scar can be easily made by following the path across the lower slope, crossing the wall by means of a tall ladder stile and following the rising path immediately beside it. 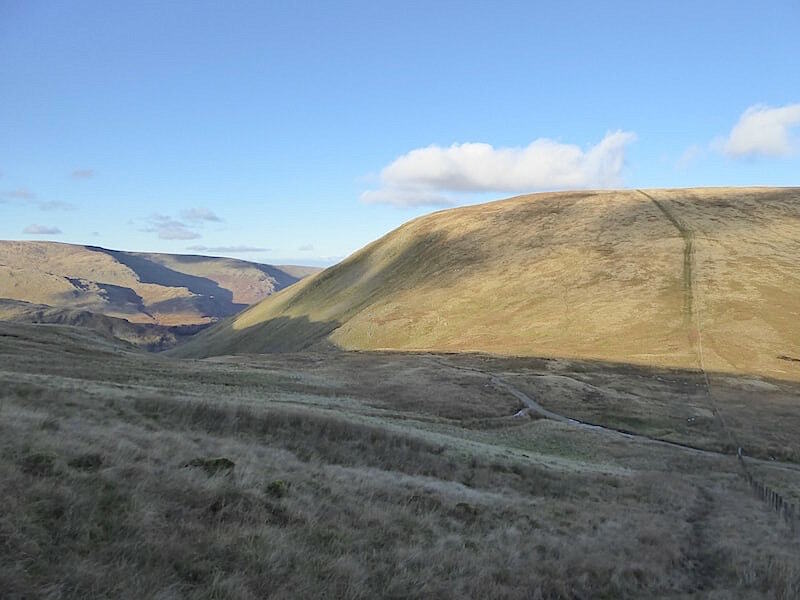 Once again a spell of sunshine to mark our arrival on Goat Scar, not alas on us but it did light up the lower part of Longsleddale very nicely. 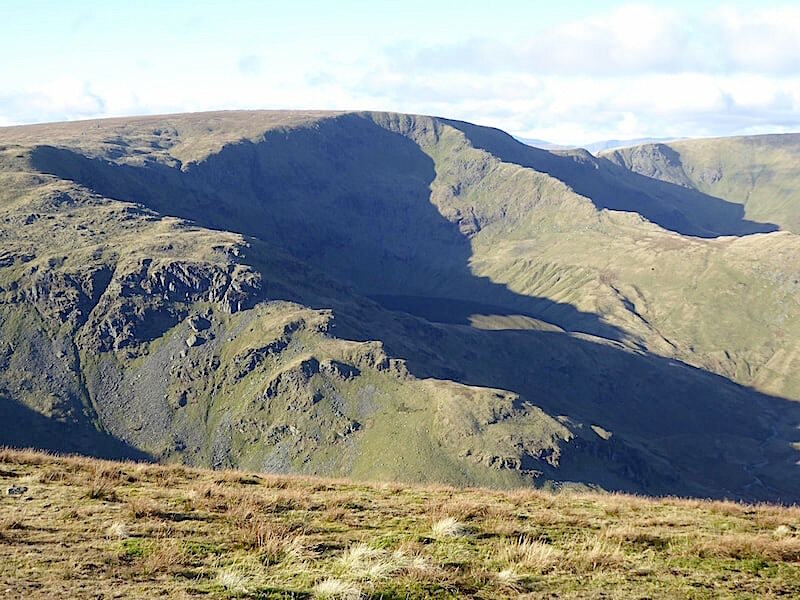 Across from us is Tarn Crag with Grey Crag enjoying a splash of sun over to the right. Looking northwards we have a view of Upper Longsleddale. 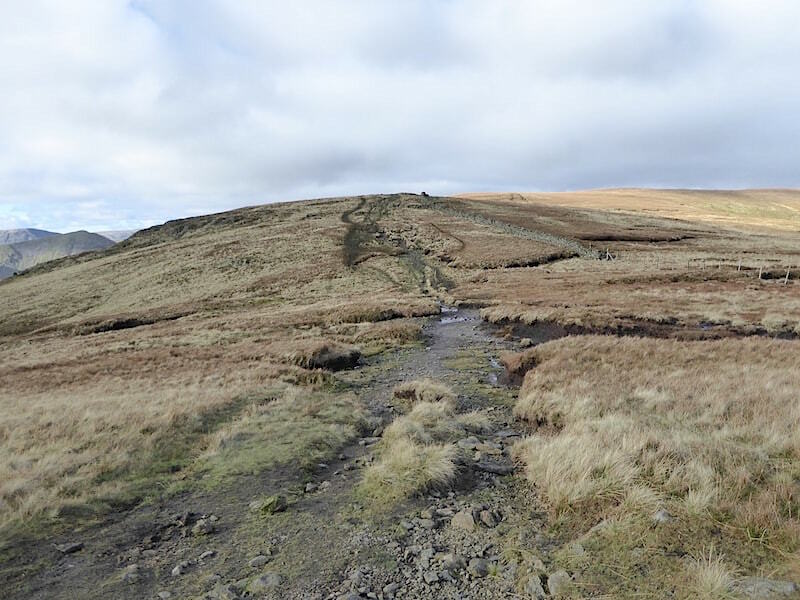 The footpath coming up from Sadgill is leading up to Brownhowe Bottom, another extensive area of marsh and general wetness. 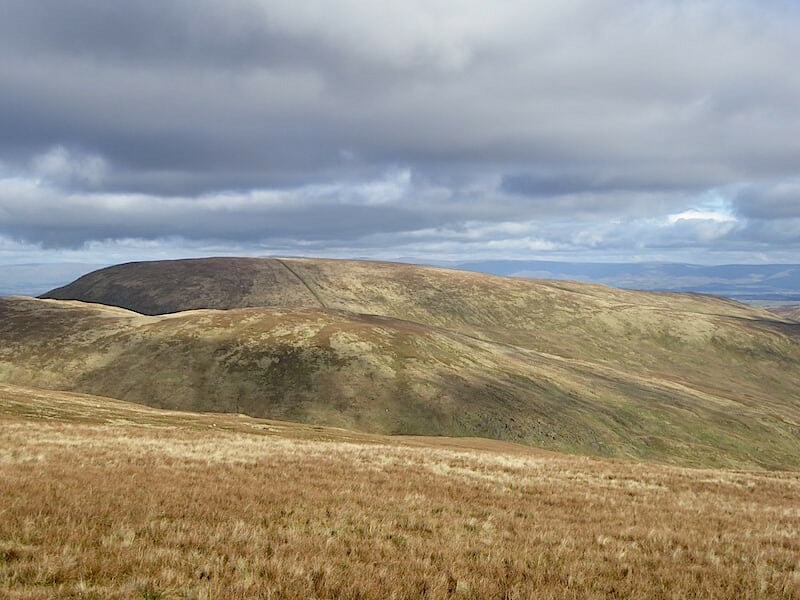 The highest point on the skyline is Branstree with Selside Pike to its right and Adam Seat to its left. We still have the large cloud layer so the view is a bit low key today. 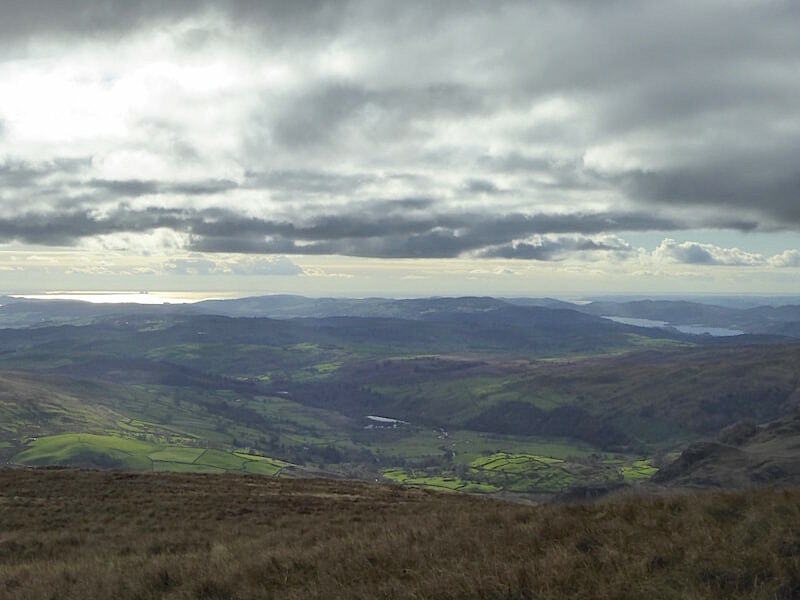 Looking south west and in the distance Morecambe Bay shimmers in the sunlight. 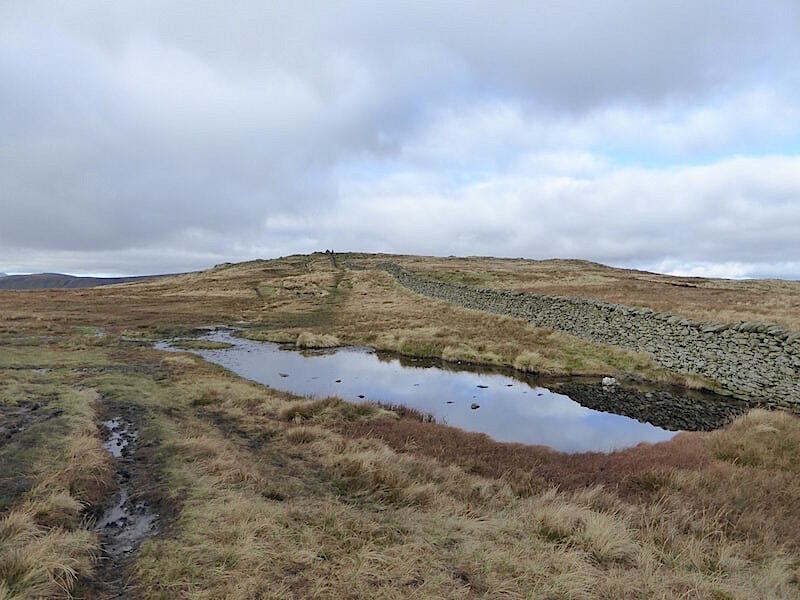 Shipman Knotts summit is over on the centre right and below it is Green Quarter Fell with Skeggles Water looking like nothing more than a large puddle on top of it. A little further southwest Morecambe Bay continues to shimmer with Windermere over on the right looking very dull in comparison. 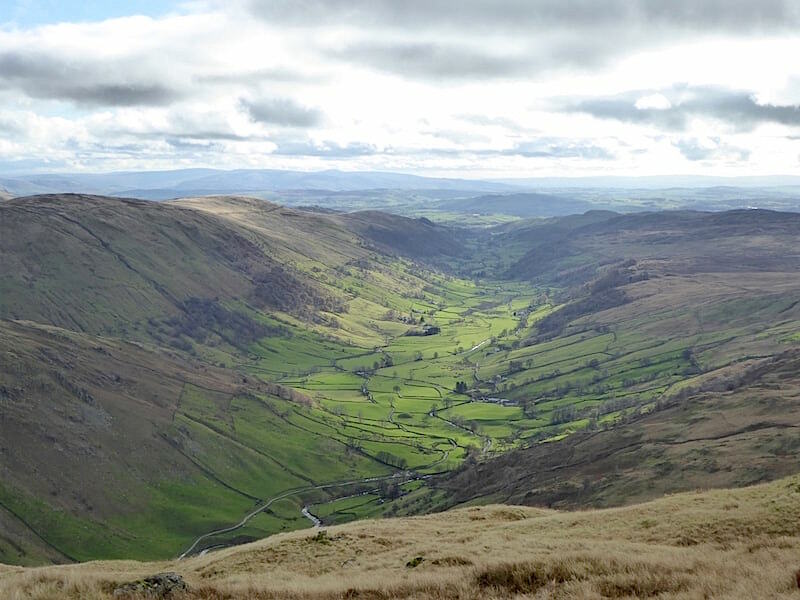 The green fields of Kentmere momentarily lit thanks to a brief gap in the cloud. 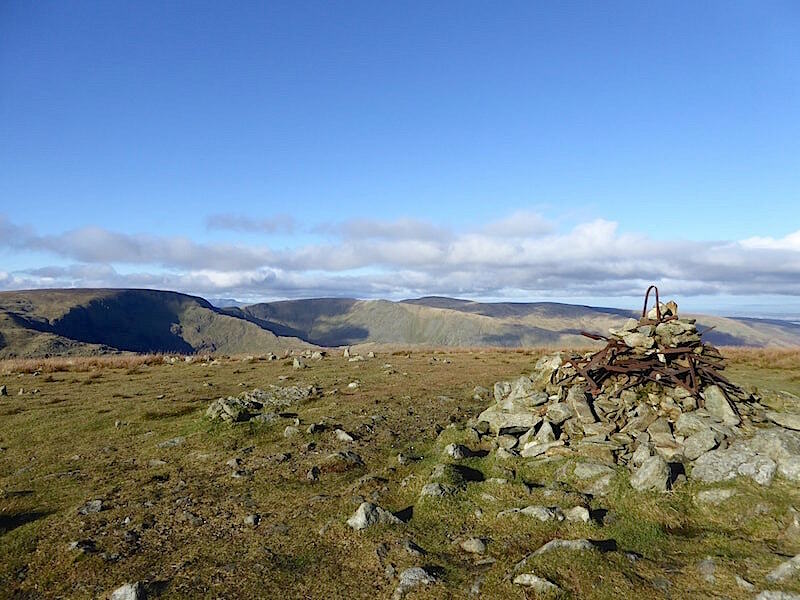 After our detour to Goat Scar we continued on up to Kentmere Pike. 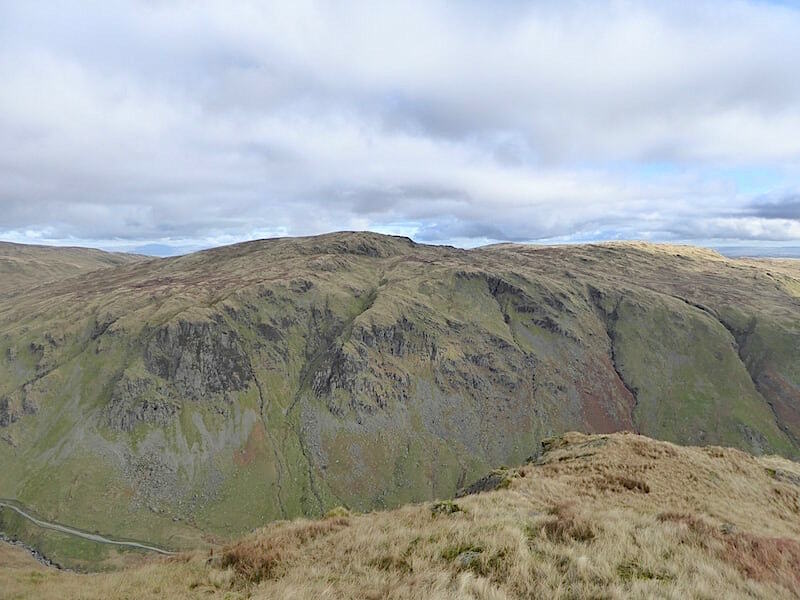 There’s not a lot to see in front of us so I took a look back for this view of Goat Scar in the centre with Shipman Knotts below it. 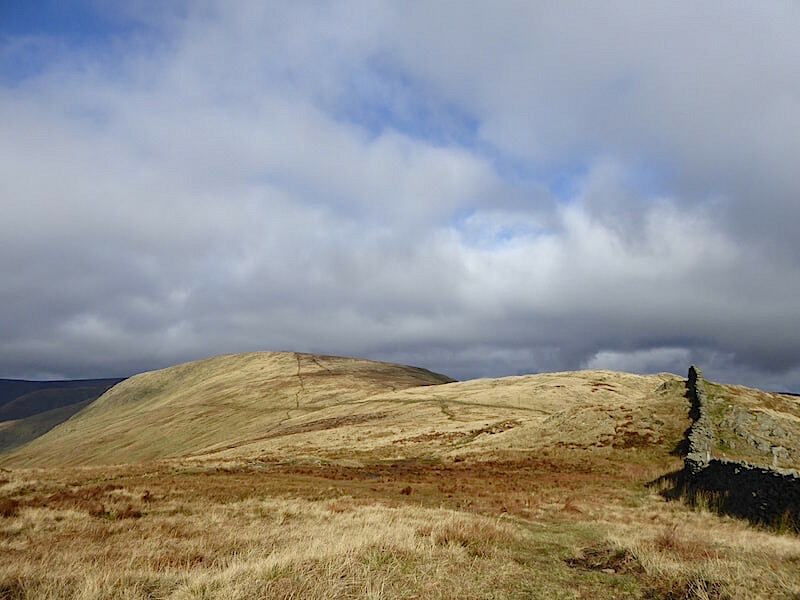 Looking ahead as we plod over to the summit, considered by AW to be rather unattractive and uninteresting. Today’s cloud and all the general wetness did nothing to improve things either. 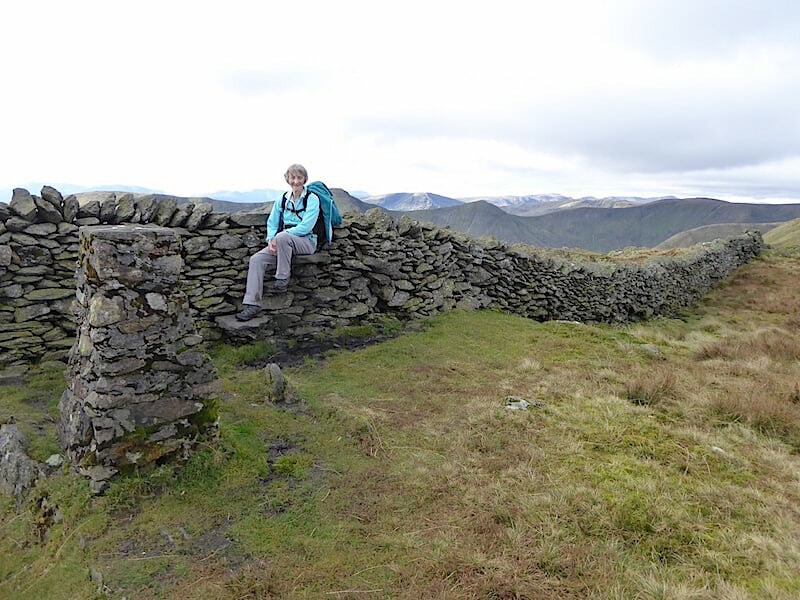 Having a sit down for a minute or two on the step stile at the trig column on Kentmere Pike …..
….. then back across the wall to the summit cairn on the other side to see sunshine beginning to creep over Yoke and Ill Bell. 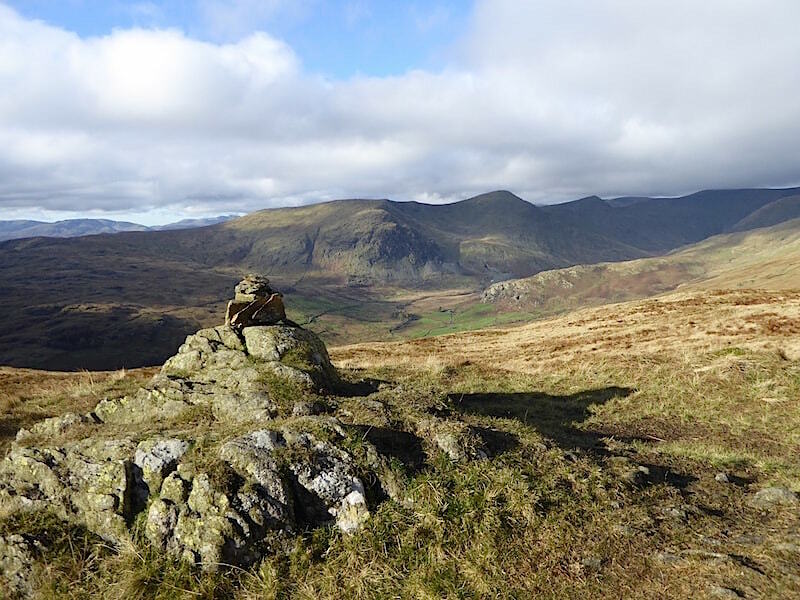 So, since somewhere over yonder is the summit of Harter Fell, we make our way northwards and head towards it. 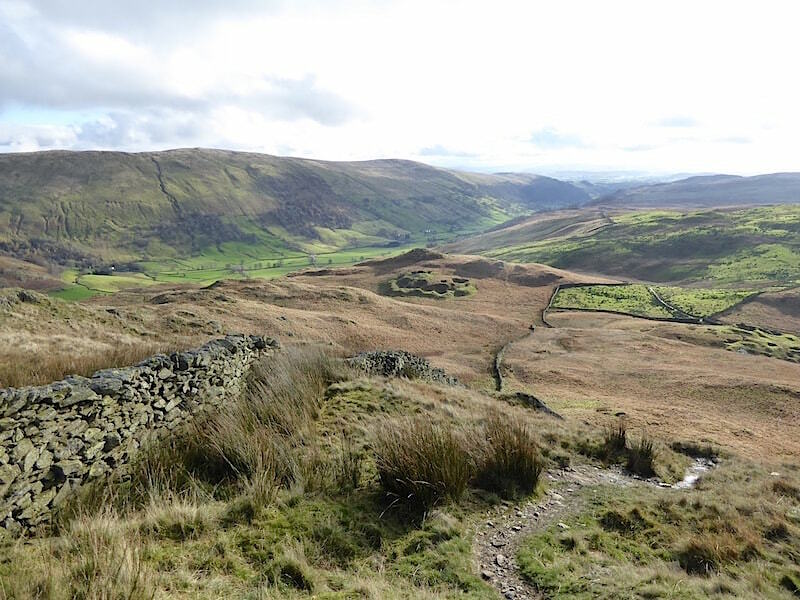 Brighter weather coming in from the west as we make our way across …..
….. with puddles, pools, gloopy peat hags and general squelch all the way across the …..
….. one and a quarter miles between Kentmere Pike and Harter Fell. In AW’s day he noted that the path was intermittent. Not any more, now its as plain as a pikestaff! 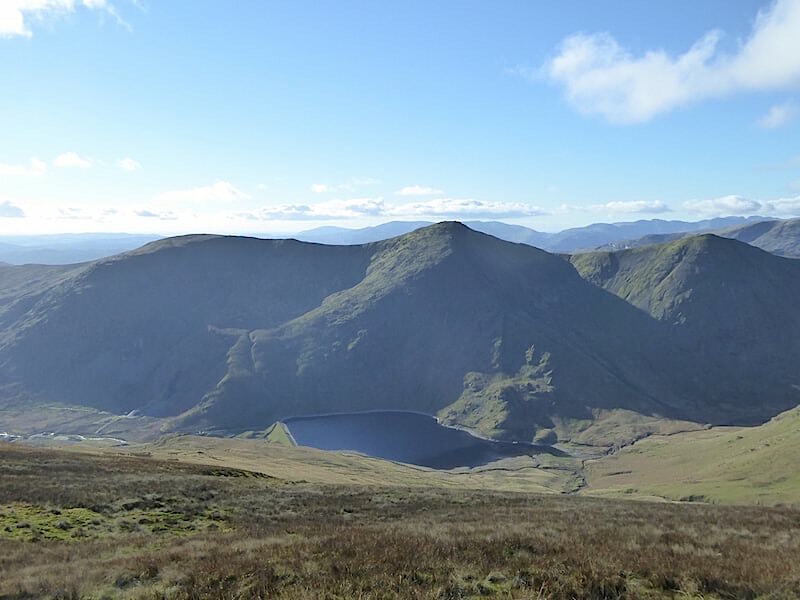 The day is getting brighter, the sunny spells grow longer and the views improve as we tramp across. A close up of Branstree with Adam Seat just below it over to our right as the grey cloud drifts away to the east. 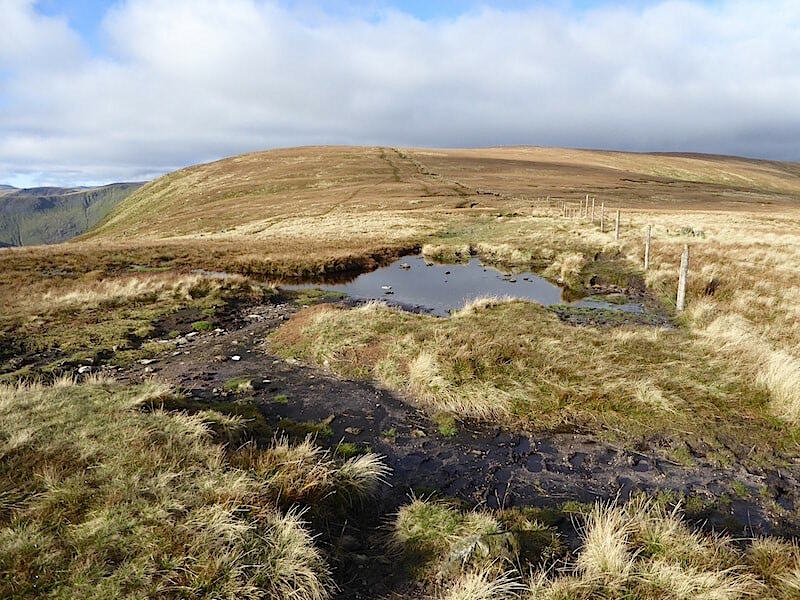 Deep, wide and extensive peat hags needing lengthy detours to avoid them occurred at all too frequent intervals along the route …..
….. and here comes another one. 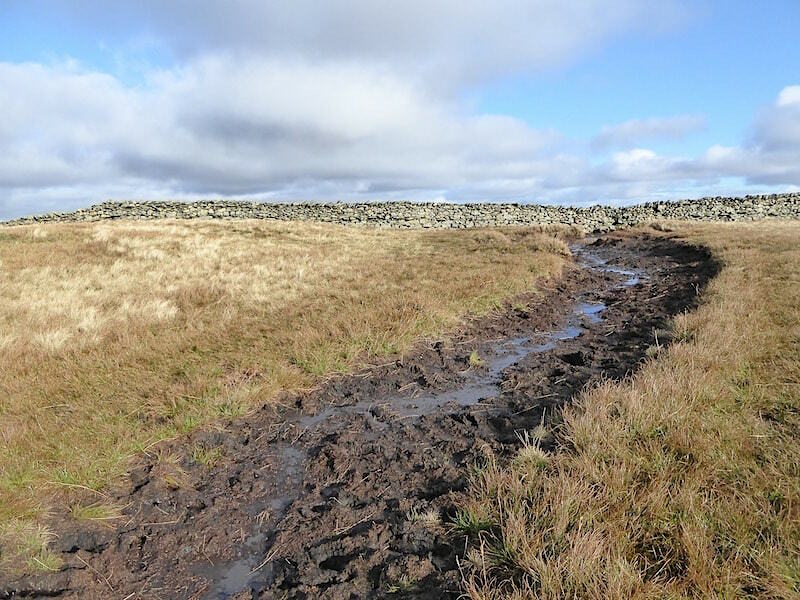 Anyone who has viewed our walks over these past few months must be as tired of reading about squelchy routes by now as we are of walking them. A spell of dry weather, or some heavy frosts would be much appreciated. 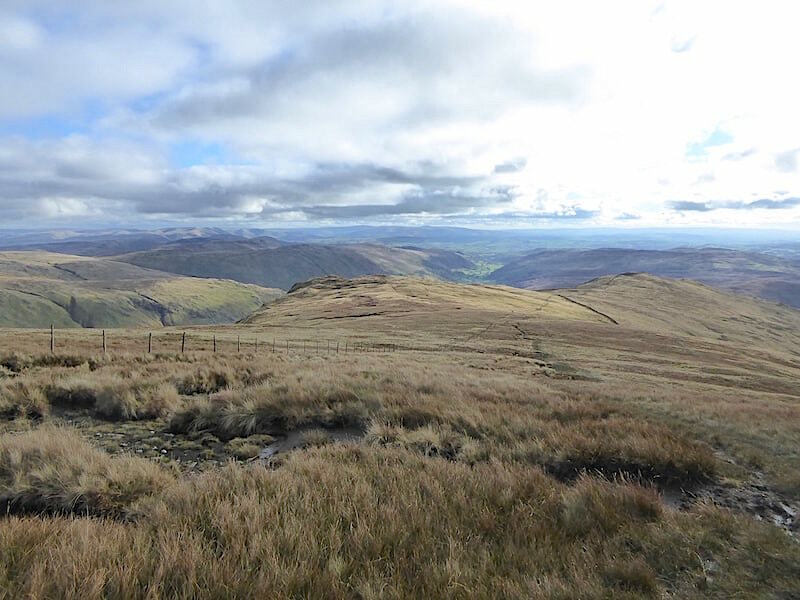 A fell runner came splashing by us and without stopping asked us if that was Kentmere Pike down there, yes we replied, thanks he said, turning out nice now in’t it, and off he went towards the next batch of pools, with another runner steaming up the slope behind us. 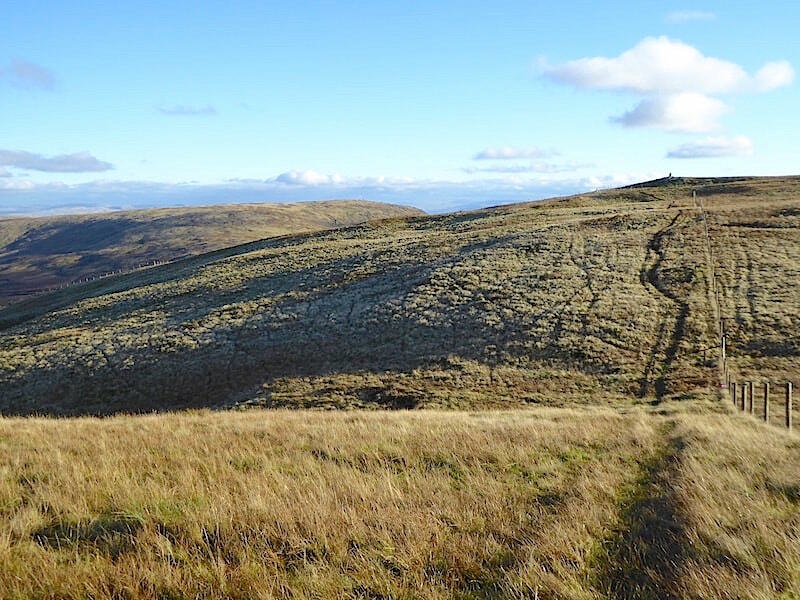 The place looks empty of walkers but there were quite a good number of folk up here today. 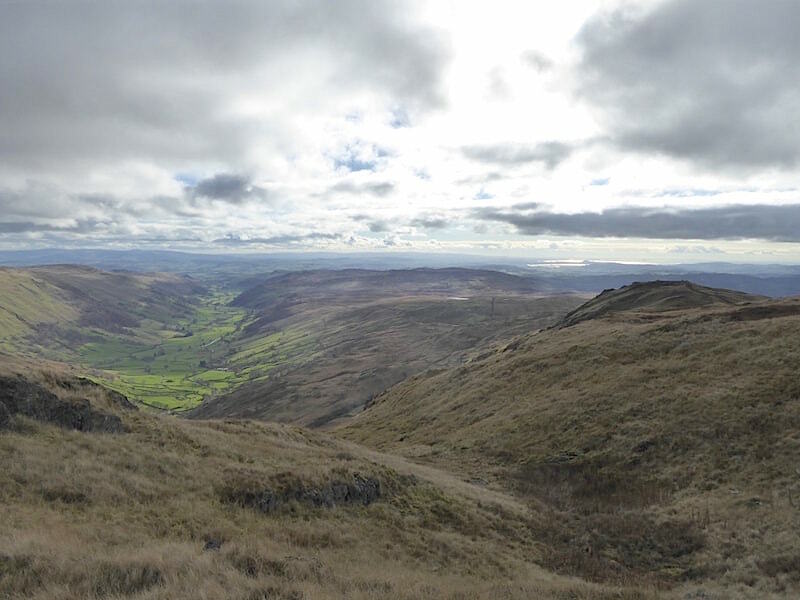 On we plod, with good views now of the fells on the eastern side of Longsleddale, Branstree on the left and Tarn Crag and Grey Crag on the right. 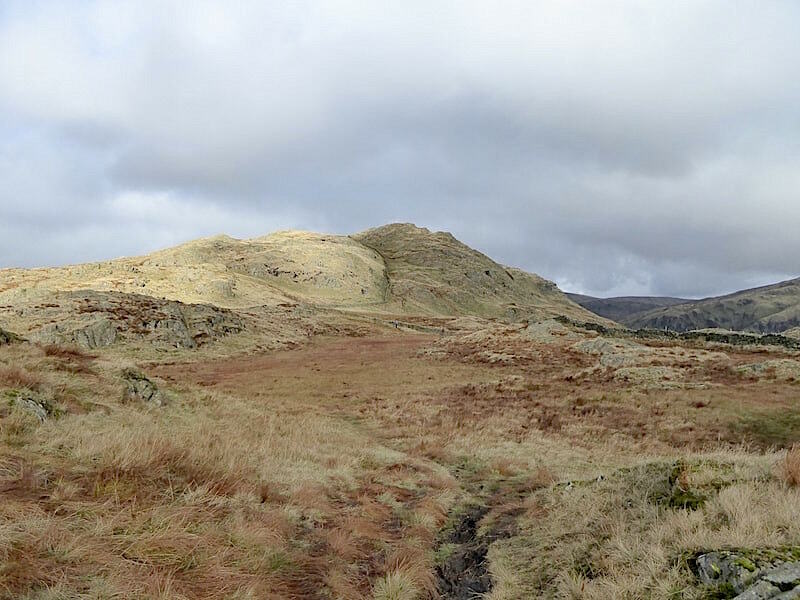 A closer look at Tarn Crag with Grey Crag, looking suitably grey, just to the right of it. We left the main path to join the one along the rim of Harter Fell which heads over to The Knowe …..
….. which provides a lofty view of Kentmere Reservoir together with Yoke, Ill Bell and Froswick …..
….. while ahead of us is the ridge route from Harter Fell down to the Nan Bield Pass and up to Mardale Ill Bell, together with a good view of the vast summit area of High Street above all of them. 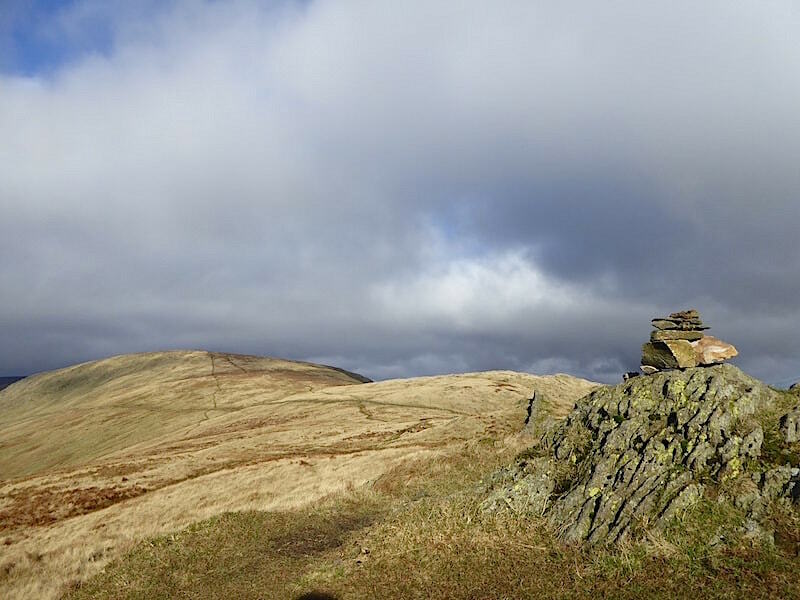 Harter Fell’s summit cairn which, according to AW had something of ‘a nightmarish quality’ to it. The sketch he made of it had numerous old iron fence posts protruding from the stones which did look as though some devil’s pitchforks had been thrust into them. No nightmarish quality today though, its turned into a lovely day with warm sunshine and not even a breath of breeze. 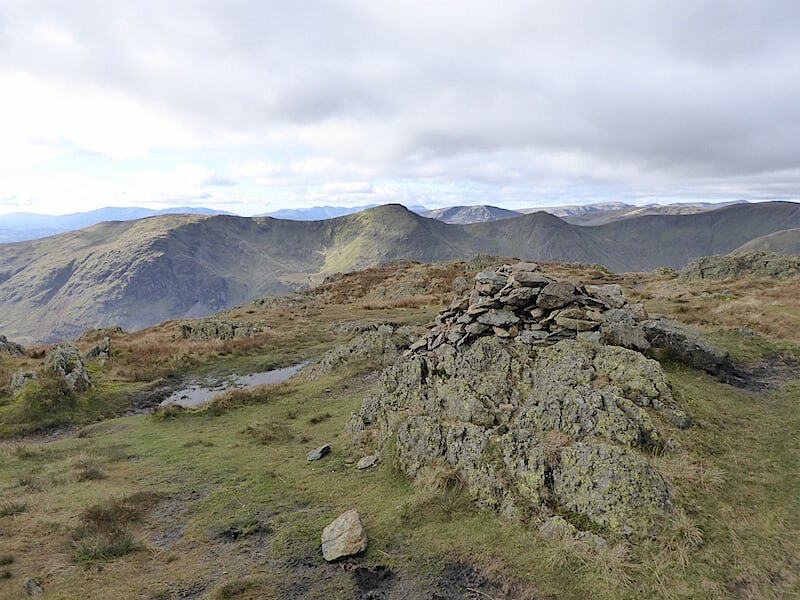 We decide to walk down to the lower, and very similarly constructed, second cairn to have a bite to eat and just enjoy the stillness of the moment …..
….. and from where, on the far distant skyline we can see all the fells from the Scafells, below the cloud on the left, all the way across to the Helvellyn range, also below some cloud, over on the right. 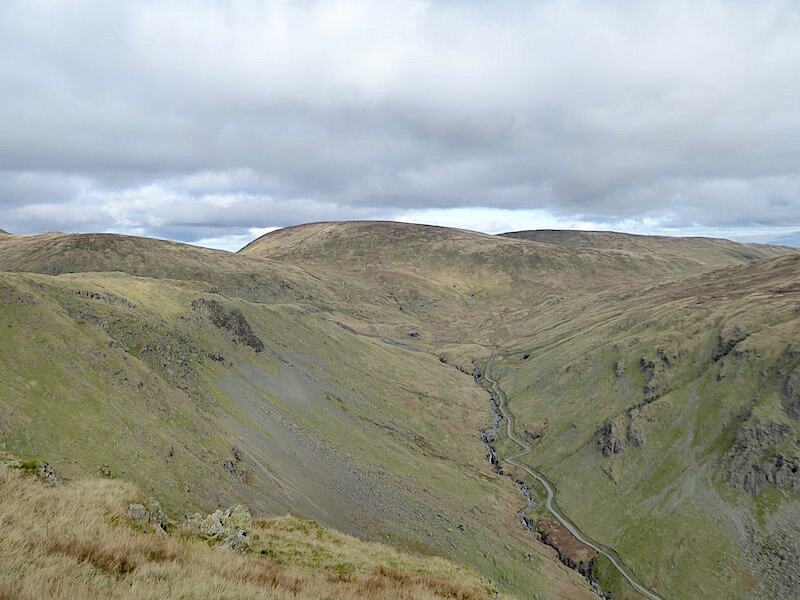 Deep shadows below High Street and Long Stile below which lurks Blea Water although you might have to zoom in to be able to make it out. 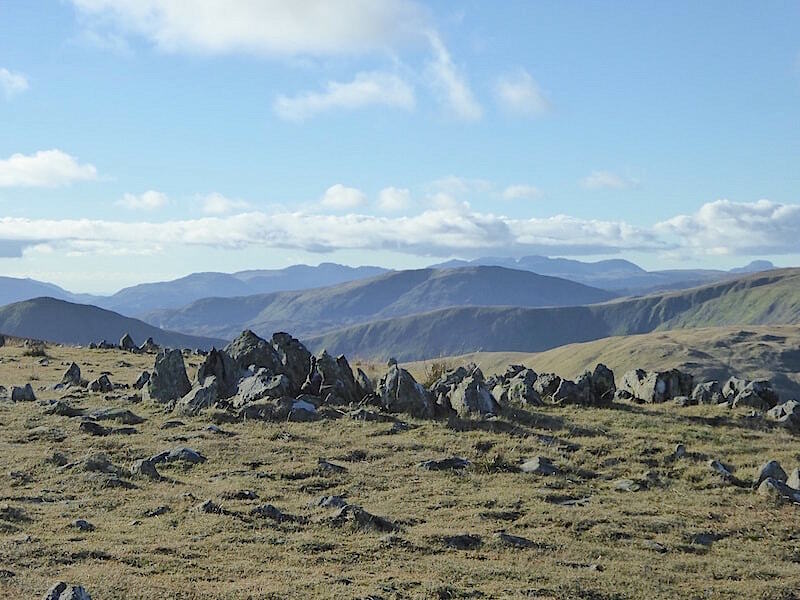 As we chomped on our sandwiches we entertained ourselves identifying the fells on the distant skyline. 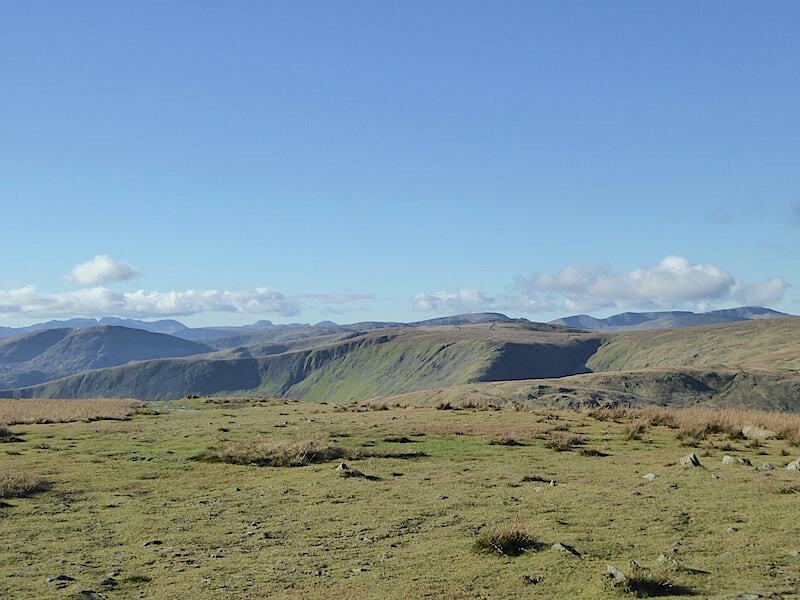 Ranging left to right are Swirl How and Great Carrs, in the dip is Harter Fell in Eskdale, then comes Pike O’Blisco, Crinkle Crags, Bowfell, Scafell, Scafell Pike, Great End, Lingmell and then over to Great Gable on the extreme right. Its not often you get to see them so clearly outlined against the sky, or so still a day in which to enjoy them, and it was a real treat just to sit here in the warm sunshine and just let it all wash over us. 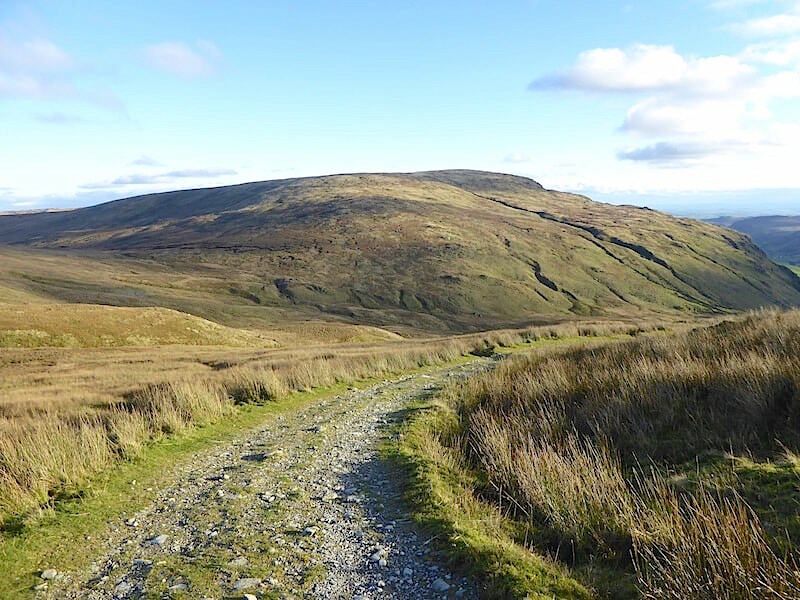 Further to the north west there’s High Street, Rampsgill Head, Kidsty Pike and High Raise. By now the cloud was high and well broken so the views in the clear northerly air would have been good wherever people were walking today. 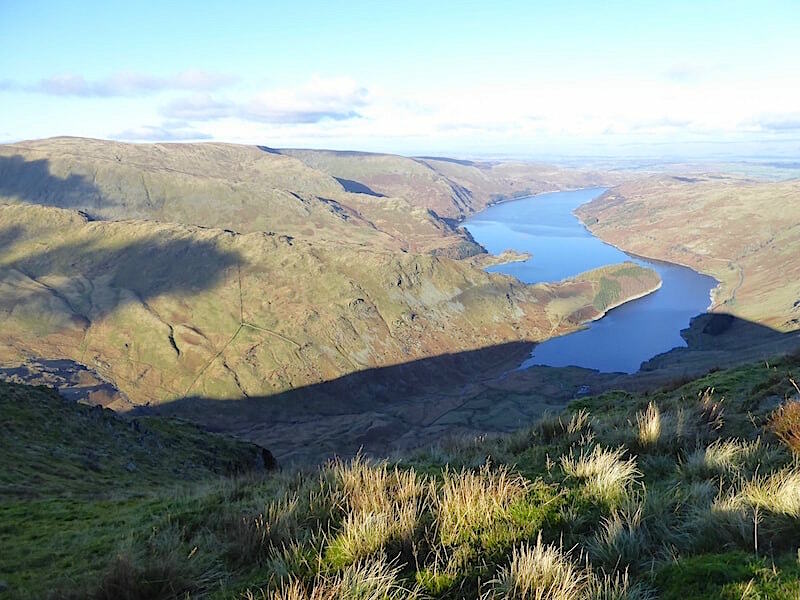 All good things come to an end though and we hoist packs once again and begin the return leg of the walk which begins with some lovely views of Haweswater. 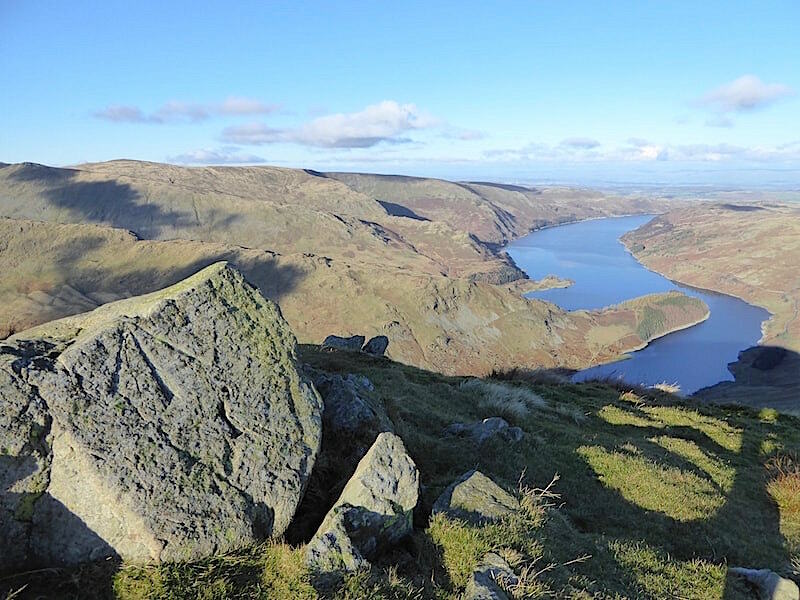 The boulder with the arrow head mark high above Haweswater which AW drew a sketch of himself sitting beside whilst smoking his pipe and enjoying the view. You can’t help but think of him when you pass by it. 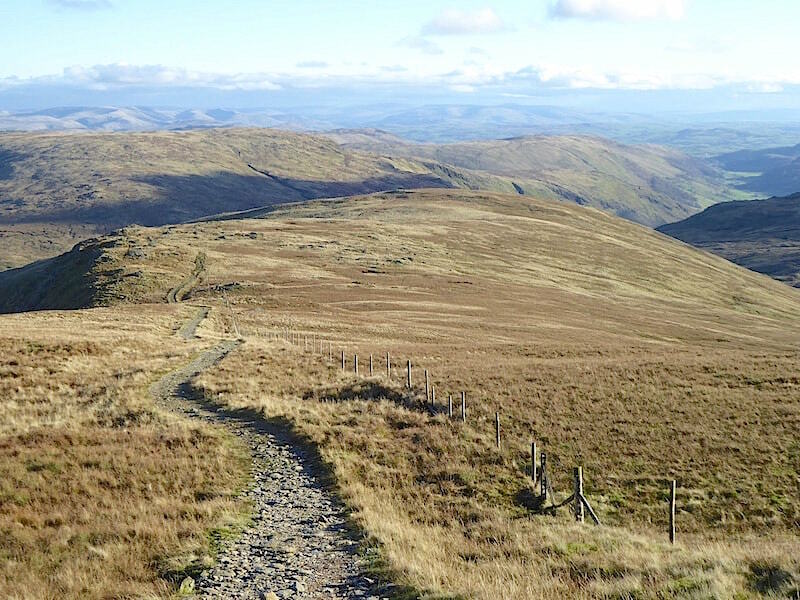 Straight ahead of us as we walk along are Branstree with Selside Pike just beyond it …..
….. and at last we have a dry path from which to enjoy the views. 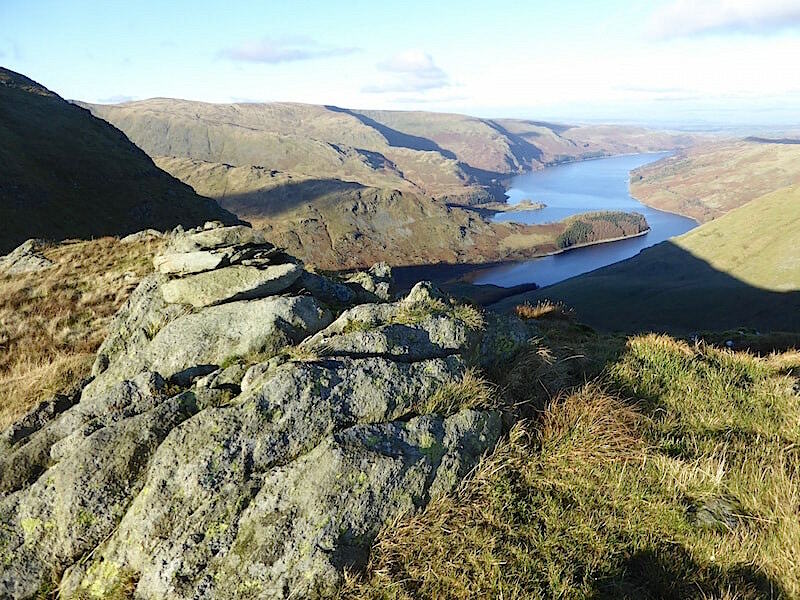 It was difficult to resist taking yet another shot of Haweswater as we reached another viewpoint. 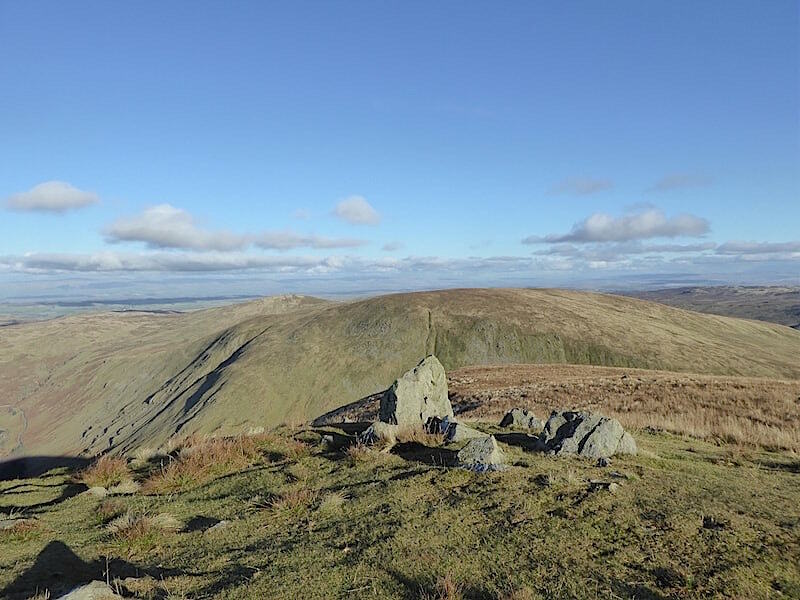 Eventually we turned off the main path down to Gatescarth and headed off across to Adam Seat …..
….. and a look back from the boundary stone perched on top of it with H for Harrison, the landowner in Longsleddale parish to the south, on one side …..
….. and L for Lowther, the landowner in Shap Rural parish to the north, on the other. From Adam Seat we returned to the stile and made our way down alongside the fence to the Gatescarth Pass route down below where its a right turn for us back down to Longsleddale. 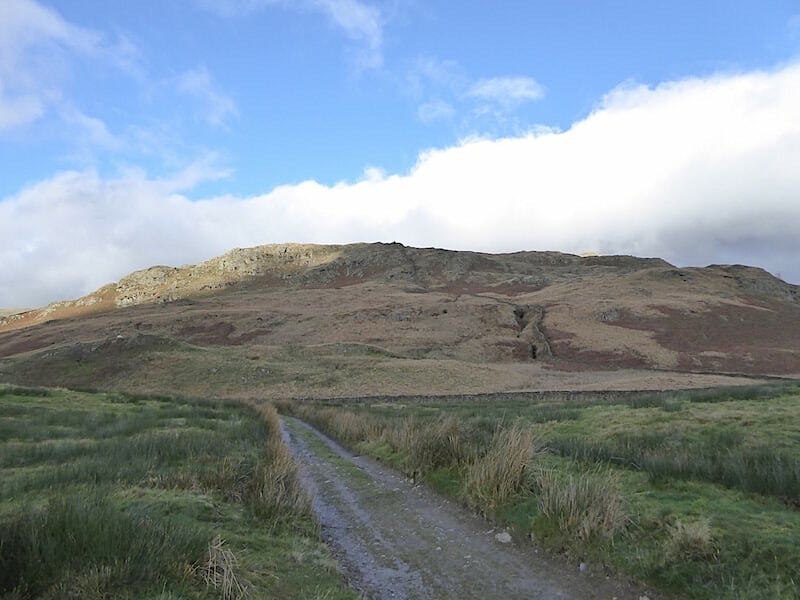 Tarn Crag ahead of us as we make the enjoyable and sunny tramp back down to the valley but …..
….. the further we drop down the more we step into the shadow of Harter Fell’s great bulk so it begins to turn a little cooler although there’s still no need for a jacket. 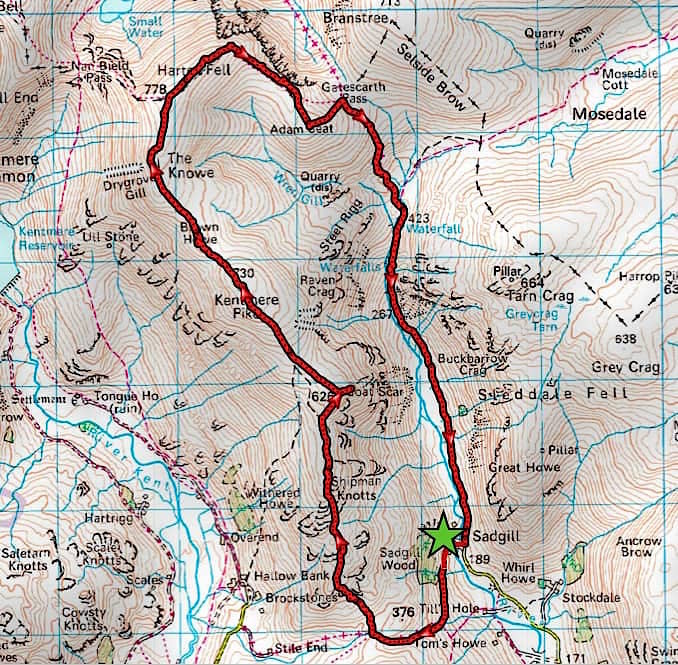 A look back at our route so far as we reach the signpost marking the path junction at Brownhowe Bottom. Straight ahead is Goat Scar from where we had the good views earlier today. A bank of cloud arrives so the sunshine disappears for a while. 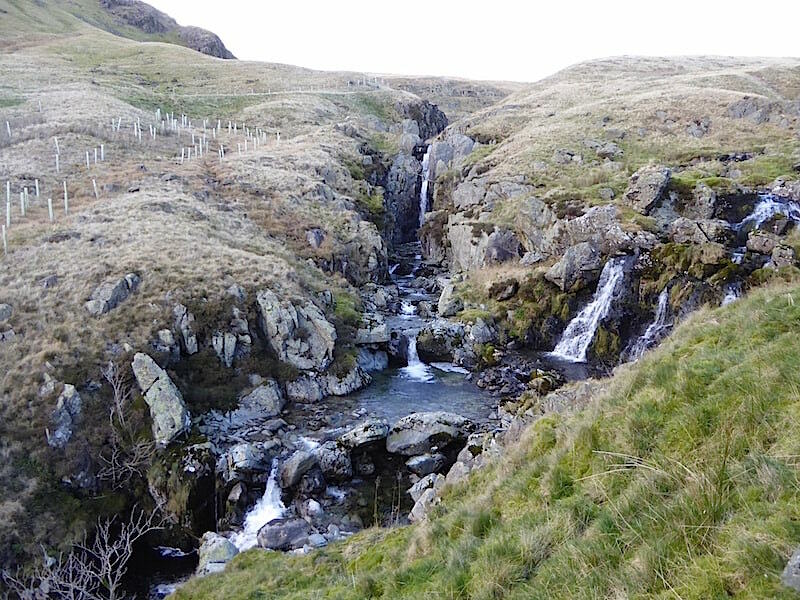 The attractive falls and pools created at the confluence of Wren Gill on the left, and another tributary coming in from the right …..
….. with another set of falls just a little further down. 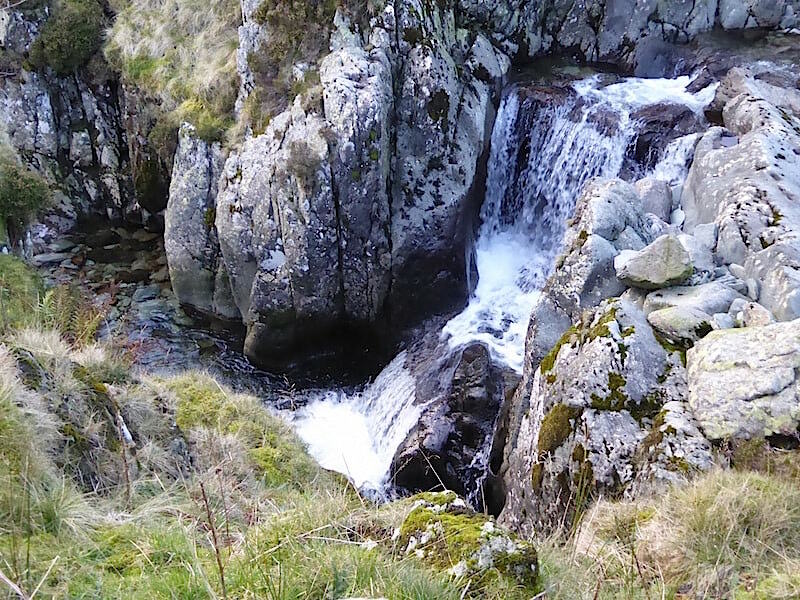 The surging turbulence of the water, together with the gravel crunching under our boots, were the only sounds accompanying us as we made our way down. 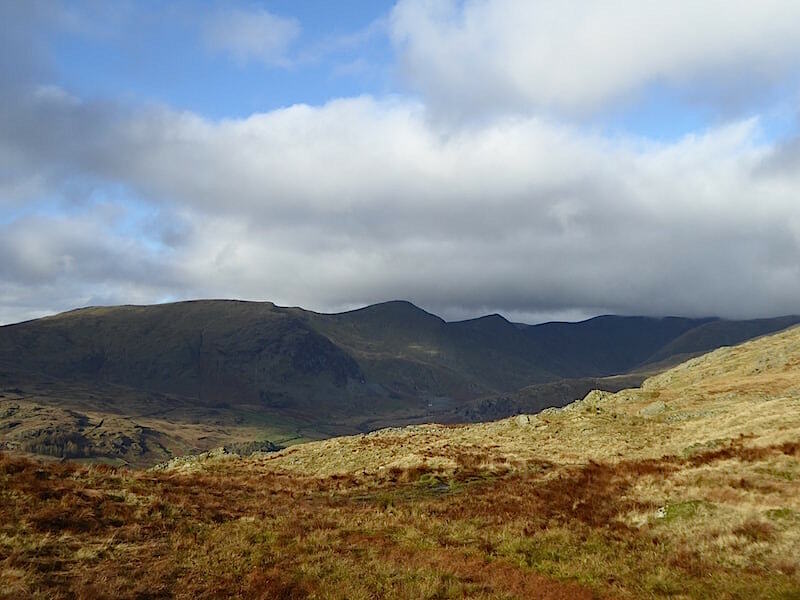 The clouds cleared away once again but blocking it from reaching the valley now is …..
….. the craggy peak of Goat Scar towering above the valley. 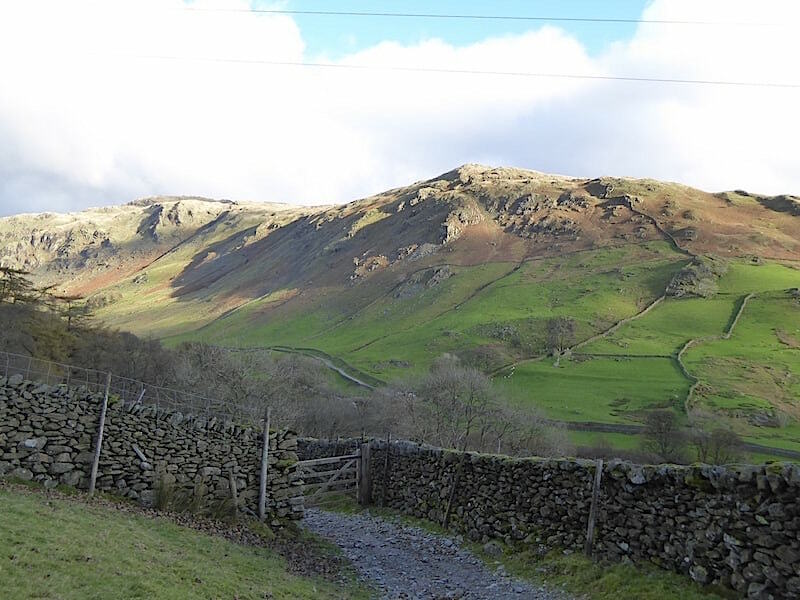 We’re well down in the bottom of the valley now, so time for a quick shot of Buckbarrow Crag, and just above the wall I notice the red jacket of a walker coming down behind us. 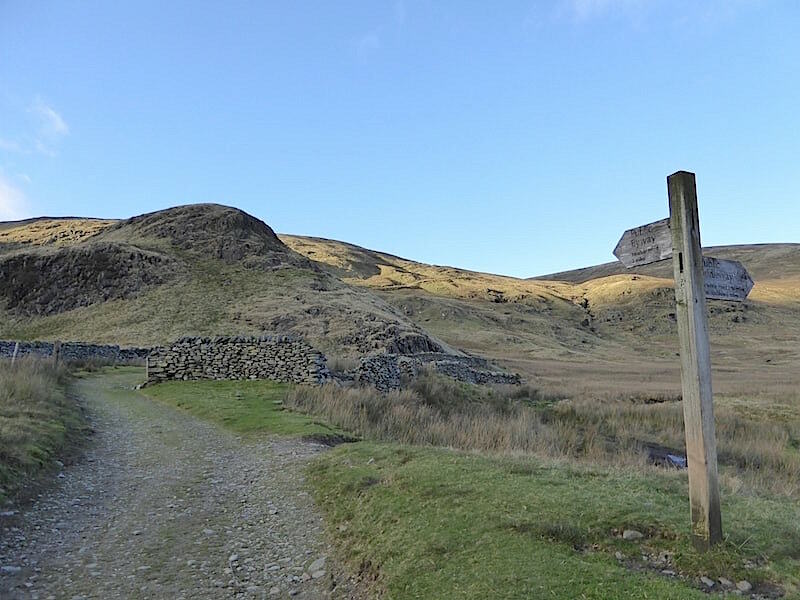 A few minutes later and we’re back at Sadgill and our walk is at an end. There are plenty of cars still parked there and their occupants have just over an hour to get back to them before the sun sets and dusk begins to settle over the valley. 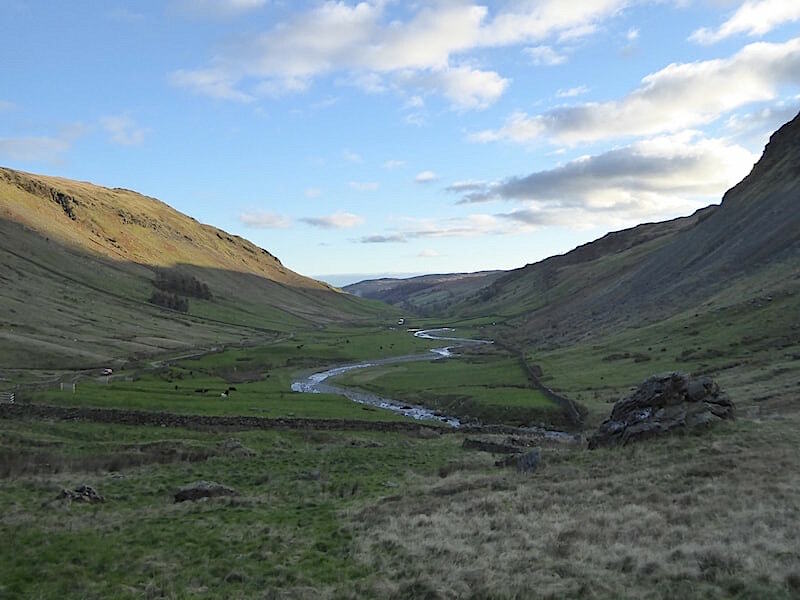 The surface of the river is already taking on the burnished sheen created by a setting sun, but given the complete absence of leaves on the trees there is no golden autumnal show to feast the eyes on in Longsleddale this year. 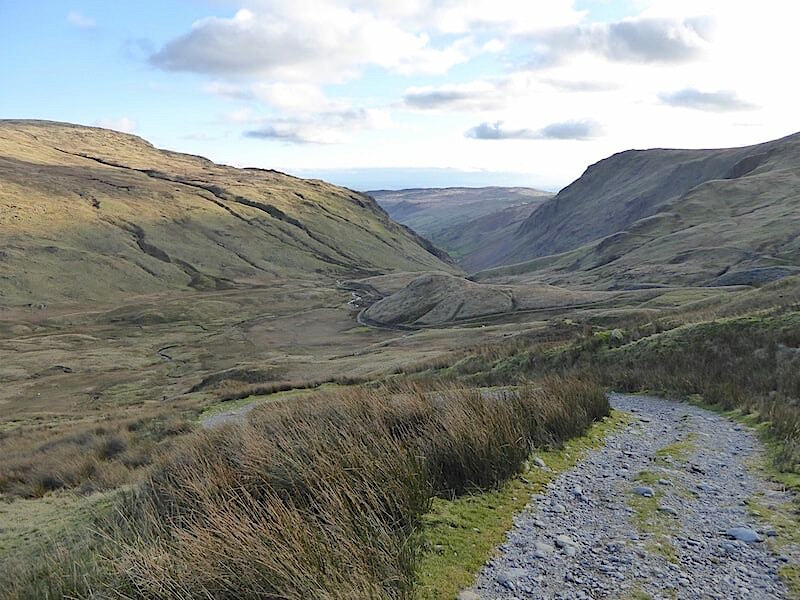 We haul weary legs into the car and start out on the long drive back down to the end of the valley. It was all going so well until a car pulled out of one of the houses just ahead of us, the driver of which proceeded at a very slow and careful pace all the way to the junction with the A6. 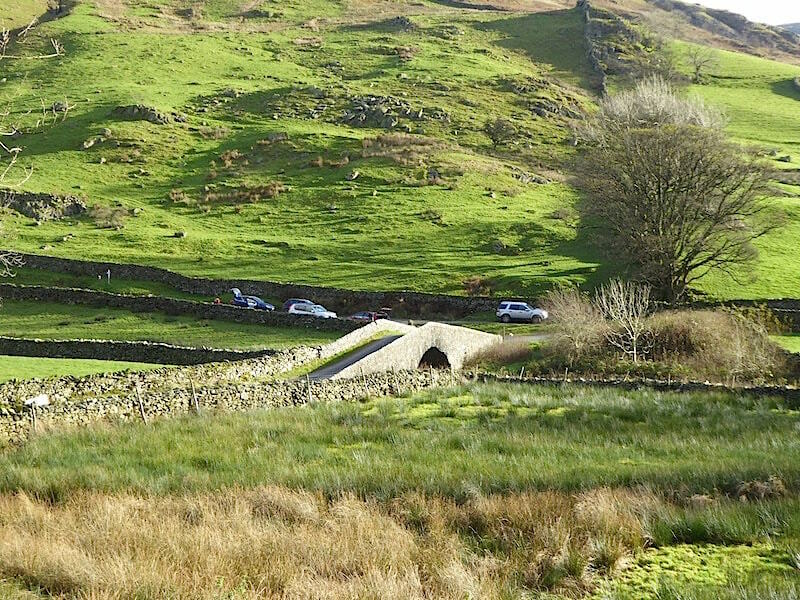 We groaned as the driver indicated left at the junction, the same way we were going, and continued along the A6 just as slowly. 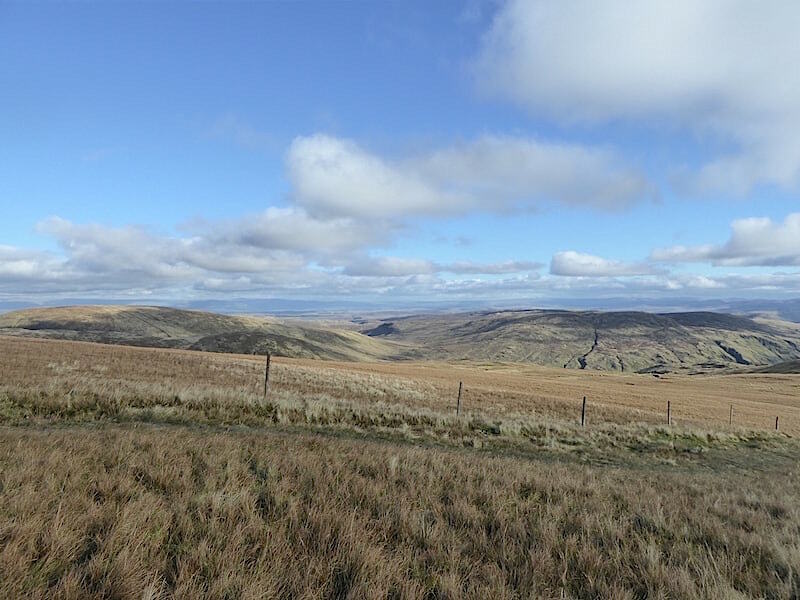 It wasn’t until we were nearing the high point of the climb over Shap that we were able to get past it.